Compassion is a necessity, not a luxury, and that it is a question of human survival. The Compassionate Coaching Framework™ puts compassion into action. We developed this proprietary method for training professionals who want to develop coaching skills that integrates the best evidence-based practices of coaching with yoga service, science, and wisdom. This unique approach balances the head with the heart and is informed by self-compassion as well as compassion for others. We start from this place of oneness - the fabric of the universe, of our planet, and of all beings. Compassion is our ability to see this deep connectedness and know that we are not separate from anything or anyone. In time, we come to appreciate that there are no boundaries, even when it often feels like there is space between us. This is the practice. Our mission is to help you clarify and activate your heart-centered vision through cultivating compassion. You will gain a deeper understanding of yourself, the relationships you have with clients, and how to lead others to a deeper purpose and bring your genius into the world with a defined plan of action. 1. 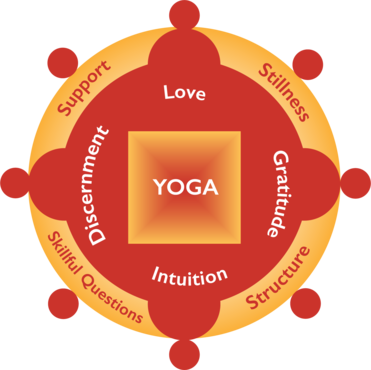 The Center: Yoga - This proven methodology provides the wisdom and science that is at the core of our system. Yoga leads to more compassion and interconnectedness. Studying and practicing The Eight Limb Path provides the foundation to becoming a masterful coach. 2. The Circle of Practice: Love, Gratitude, Intuition, Discernment - These four values-driven practices help coaches access and amplify compassion for others, including their clients. Mastering these skills leads to creating sacred space, providing a trusted, safe and productive environment for coaching. 3. The Circle of Mastery: Skillful Questions, Support, Stillness, Structure - Coaches learn to expertly select and sequence these four elements in every session to ensure depth, personalization, and effectiveness. Ultimately, this part of the framework brings more service to world as clients put their visions and compassion into action.